Honor View 20 aka Honor V20 is due to be launched in China on December 26. The smartphone is the first from the Huawei sub-brand to sport a 48-megapixel rear camera and a display hole for the front camera. The company in the run up to the launch next week has been teasing the smartphone regularly, revealing new features that weren’t mentioned during the unveiling. There have been several leaks in the interim as well. Now, fresh leaks bring pricing information along with a new photo of the Maserati Edition. The company has confirmed that the Honor V20 will sport a 48-megapixel Sony IMX586 sensor, HiSilicon Kirin 980 SoC, Link Turbo technology, a 4,000mAh battery and a 25-megapixel selfie shooter in the display hole. A leak on Weibo suggests that the Honor V20 will be priced at CNY 2,799 (roughly Rs. 28,400) for the 6GB RAM + 64GB storage option and CNY 3,299 (roughly Rs. 33,500) for the 6GB RAM + 128GB storage option. The smartphone is also already listed on Vmall for pre-order with a deposit of CNY 100. It is listed in Charm Blue and Midnight Black colour option. A separate leak on Weibo shows us what the back of the Honor V20 Maserati Edition will look like. The smartphone is seen sporting a Maserati logo at the back, a triple camera setup at the back, and the Honor branding at the bottom rear. The smartphone is also seen sporting two speaker grilles at the bottom edge of the device. Alongside the Maserati Edition back panel photo, the retail box image has also been leaked, and both can be viewed below. 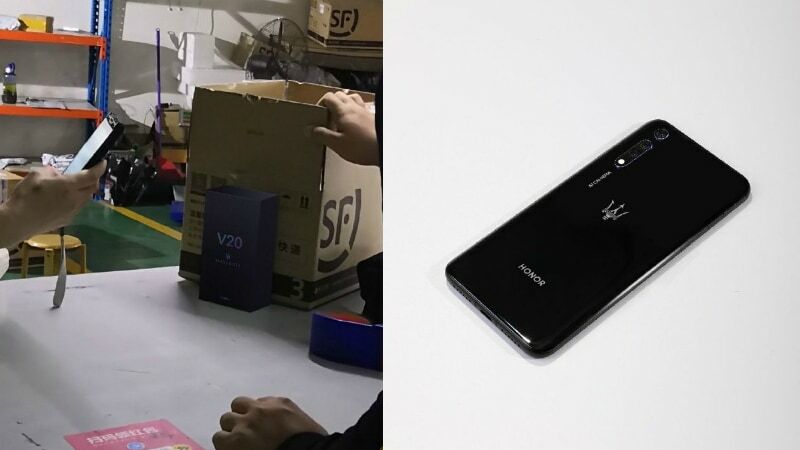 The Honor V20 will be launched in China on December 26, and the complete specifications of the smartphone can of course be expected to be revealed on that date. The global launch of the smartphone under the name of Honor View 20 is confirmed to take place in Paris on January 22. As we mentioned, the smartphone is already confirmed to sport a 48-megapixel rear Sony IMX586 sensor with features like a 1/2.0-inch CMOS sensor , 4-in-1 Light Fusion, 4 times sensor HDR, and certain AI functionality. It will be powered by the latest HiSilicon Kirin 980 SoC, and will sport a near bezel-less design without a notch as it has a 4.5mm camera cutout on the display for the selfie camera. The smartphone will compete with the Samsung Galaxy A8s and the Huawei Nova 4 devices announced recently, as they both sport a display hole for selfie camera design.